Of all the misnomers we encounter in the automotive aftermarket, one of the most common stems from the confusion surrounding the TREMEC T-56 6-speed transmission and its Magnum 6-speed protégé. Granted, one could argue that the two models have more in common than not; however they are in fact completely different transmissions. If you are considering a TREMEC for your car, it’s important to know the differences in order to make sure you don’t waste money on the wrong transmission, or one that falls short of your performance objectives. Appreciating the differences between the Magnum and its T-56 predecessor starts with knowing the history of both transmissions. We’ll start in the late 1990s, when TREMEC was well on its way to becoming a household name among stick-shift enthusiasts, thanks to the growing popularity of our TKO transmission in the budding 5-speed muscle car conversion market. During this same period, following the acquisition of BorgWarner’s manual-transmission business in December 1996, TREMEC was successfully producing the T-56 for use in just about every rear-wheel-drive performance car being offered by the Big 3 automakers – and even a few outside of them. As the hot rod restomod market continued to explode, the TKO – re-released in 2004 as the TKO-500 and TKO-600 – continued to lead the charge, particularly among those with early engine combinations. The T-56, however, had garnered appeal among enthusiasts who embraced the more recent GM LS and Ford Modular engines. At the same time, salvage yards had become flush with the factory offerings, making LS1/T-56 conversions from wrecked Camaros and Trans Ams in particular a very popular swap. Much like today though, the factory T-56s were tailored specifically to the OE applications from which they came, meaning that gear ratios were sometimes undesirable and shifter locations were often less than ideal for an early muscle car – forcing the use of awkward-looking custom consoles. Last but not least, speedometer provisions on the transmission were typically incompatible with classic applications. In short, these swaps left a lot to be desired. Add to that, the limited torque capacity of some factory units, as well as, the fact that many had been severely abused before ending up in a boneyard, and the need for an aftermarket solution was clear. Fortunately, the timing was right for a response from TREMEC. Prompted by ever-increasing torque demands and the desire for improved shift quality from our OE customers, in 2004, we began working on a replacement for the T-56. Debuting in the Ford Shelby GT500 for model year 2007, the new TR-6060 6-speed quickly became the go-to performance transmission of the industry. By 2008, it had superseded the T-56 in pretty much all OE performance applications. 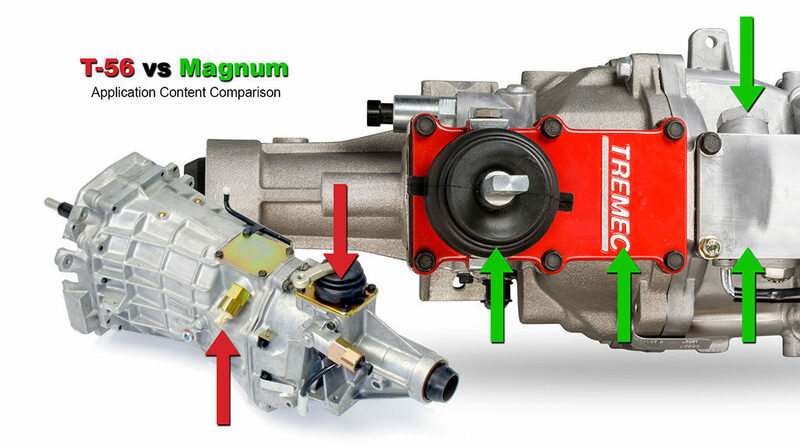 Though not a secret, a little-known fact about the TREMEC Magnum is that GM-types (left) are modeled after the 1998-2002 F-car T-56, and Ford-types (right) follow the formula from the 2003-2004 Cobra (minus the factory 10-spline input shaft). What this means is that the Magnum will interface with nearly any stock or aftermarket bellhousing and many clutch systems intended for those applications. This leaves a ton of options on the table for a wide variety of potential swaps. Addressing the need for a more flexible solution for the custom car market, our engineers also went to work on an aftermarket-only version of the TR-6060. Working with input from the TREMEC marketing team, they took swap-friendly features from the TKO and modeled the input side of the trans after the popular T-56 applications in order to leverage existing market support. GM versions of the Magnum were modeled after 1998-2002 F-bodies and Ford versions after the 2003-2004 Terminator Cobra. In 2009, TREMEC released the new T-56 Magnum. Using T-56 in the name was intended to let customers know the trans was not some brand-new, unproven design; the name Magnum signified that this new unit was indeed something special – unique from all T-56 transmissions that came before it. Unfortunately, the naming strategy confused large portions of the market that didn’t know the Magnum was actually more TR-6060 than it was T-56, and that there was little in common application-wise with either OE model. In addition, the T-56 name itself had so much goodwill in the market that many enthusiasts chose to ignore the Magnum part altogether and continued to use the T-56 moniker instead, rather than the other way around. Now that you know some of the history leading up to the Magnum, and are clear that it is not a T-56, let us take a deeper look at what separates the TREMEC Magnum and its TR-6060 sibling from the T-56 that came before them. 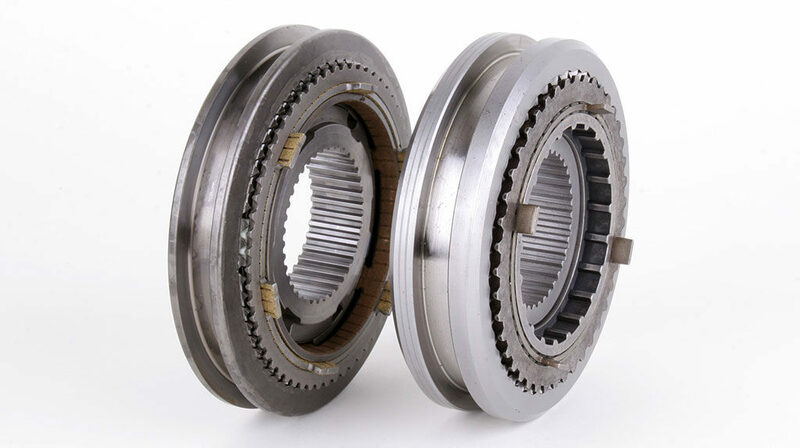 The TREMEC TR-6060 and Magnum design hinged largely on a new synchronizer assembly that featured a significantly narrower cross section than that of the T-56 (right), leaving more space between speed gears. 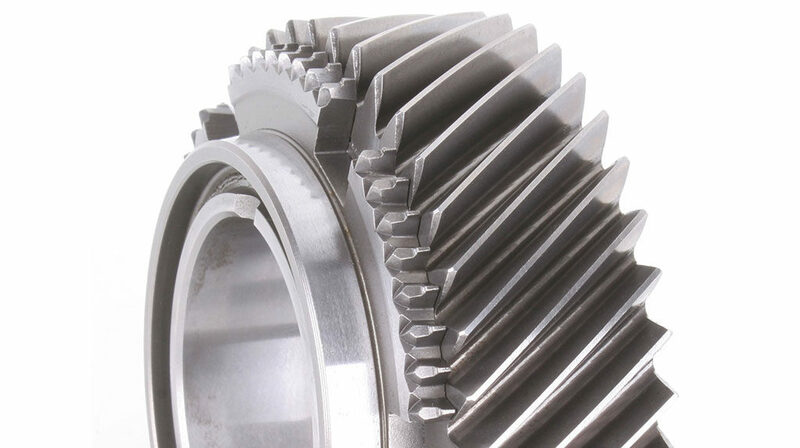 Another crucial element was the design of the speed gears themselves. 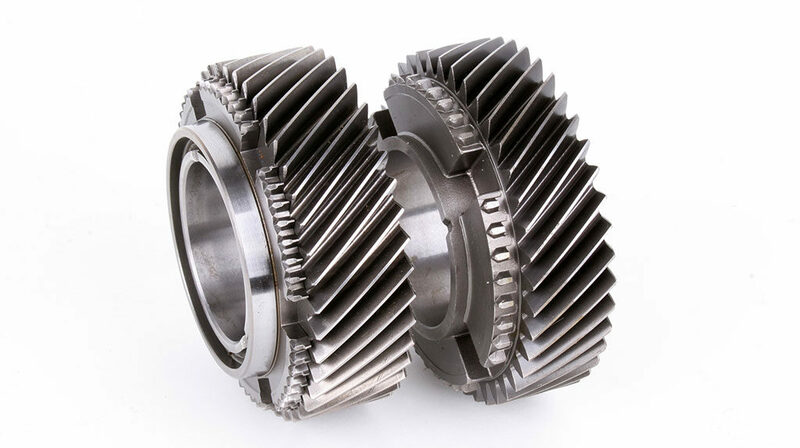 Whereas T-56 gears (right) were carved from complicated 1-piece forgings, which required generous amounts of space to be left for machining of the clutching teeth, the TR-6060 and Magnum (left) advanced to a more sophisticated 2-piece construction. 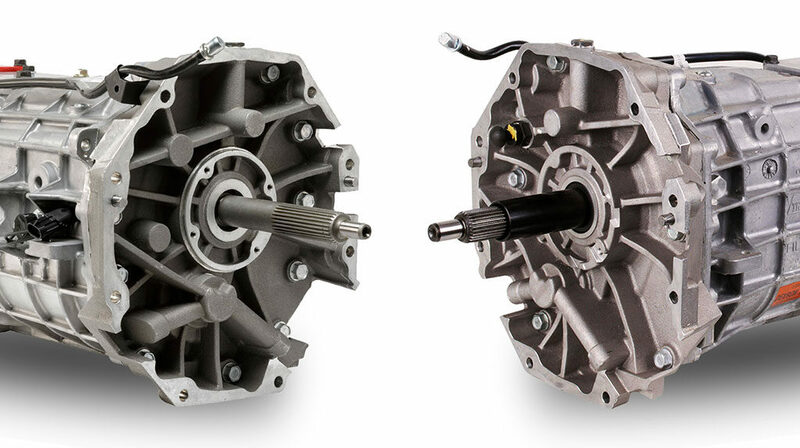 The TREMEC Magnum and TR-6060 utilize 2-piece speed gears. 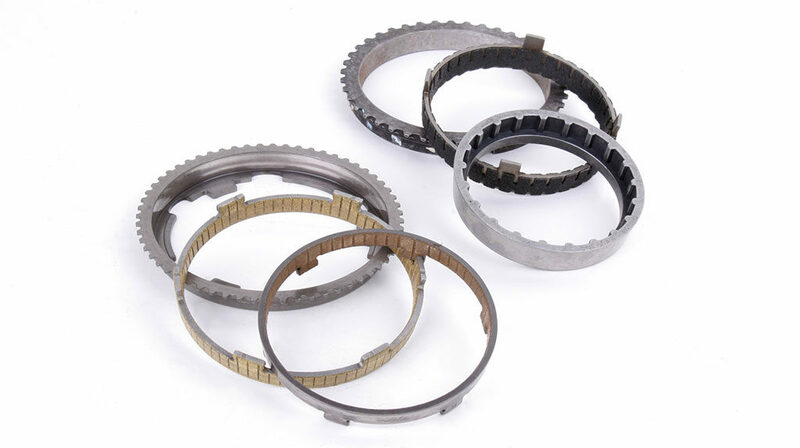 The clutching ring and gear are forged and machined separately. They are then interference-fit and laser-welded together. This type of construction does away with the previously wasted space in the T-56 design. Combined with the new synchro design, the TREMEC engineers could substantially increase the face widths of the gears, thereby increasing torque capacity. 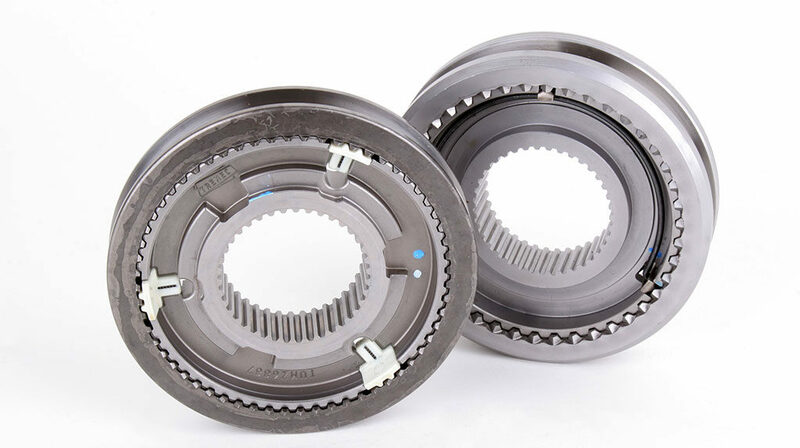 Yet another significant benefit afforded by the 2-piece construction was the ability to optimize tooth angles and profiles on both the clutching ring and gear. Note the raised “shelf” area at the heel of each clutching tooth. These are built-in stops that eliminate the possibility of an “overthrow” during a shift activity. The improvements made to the synchronizer were much more than a simple trimming of fat. The T-56 used a hoop-style retainer to hold three stamped-steel keys in place, attempting to put equal pressure at three points of a circle. Although it worked reasonably well, the design was prone to uncontrolled movement that in extreme cases could allow the keys to dislodge. Here, you can see the detents that control the fore-and-aft movement of the slider over the synchronizer hub. The T-56 design (right) used a crude but effective hoop-style retainer to hold three stamped-steel keys in place. The self-contained, ball-and-spring-loaded detents in the TR-6060 and Magnum (left) are far superior at locating the slider and controlling the motion between shifts. This translates in to greater durability and noticeably improved shift feel. 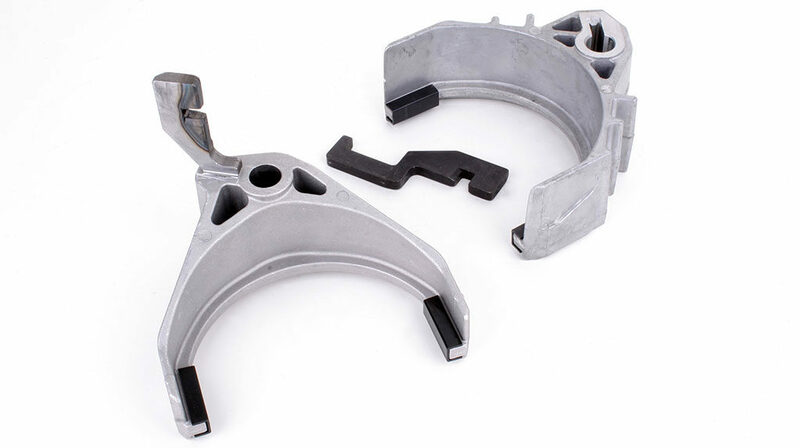 Though narrower in design, the blocker and friction rings in the TREMEC TR-6060 and Magnum have an increased diameter and a standard triple-cone arrangement for substantially more surface area and strength than the double-cone setup found in the majority of T-56s. In the case of the TR-6060, the friction materials themselves vary by application. Here, the material shown is sintered bronze. The T-56 also used several different materials. The T-56 ring shown here is a ‘particlized’ carbon. All TR-6060 and Magnums feature triple-cone baskets in the 1-2 position, and double-cone arrangements throughout the rest of the box, including Reverse. 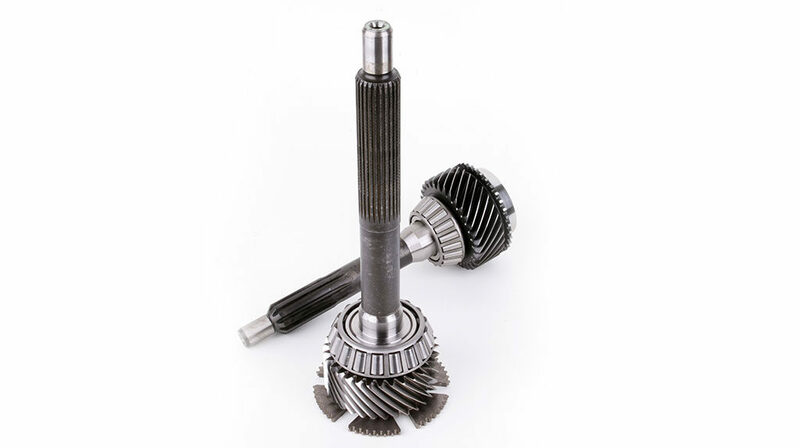 The T-56, conversely, offered a mix of double and triple cones, depending on the application, for First and Second, and, in many cases, a single cone for all other gears. A common complaint from those who liked to abuse their T-56 was the unit’s propensity to bend aluminum shift forks; thus, the installation of steel forks was a common upgrade. The problem was not so much with bending the fork prongs, but rather an issue found at the shift-rail bore. A keyway cut into the bore for placement of the shift plates, or z-links, had a tendency to wallow out and allow the fork to deflect on the rail, opening the door to a host of secondary shift-related issues. In the TR-6060 and Magnum, these links have been cast into the fork, eliminating the concern and allowing the forks to be both light and strong. As with the TREMEC T-56, the TR-6060 and Magnum use a simple yet highly effective single-rail internal shift mechanism. When you push or pull the shift handle from inside the vehicle, the rail operates these forks. The Magnum is shown at left and the T-56 is on the right. The most notable difference between the input shaft used in the T-56 and the TR-6060 and Magnum is the bearing hardware, which is much larger in the TR-6060 and Magnum. This helps the transmission endure significantly increased torque. 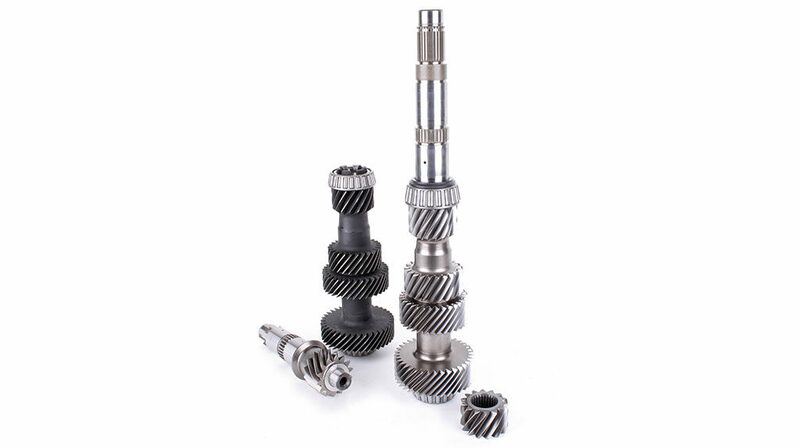 In addition, all Magnums (and most TR-6060s) use a 26-spline input shaft for maximum surface area and subsequent strength. Although there is some visual trickery on account of the composition, you can still see some of the differences between the input shaft in the T-56 (rear) and the one used in the TR-6060 and Magnum (front). Although some of the higher-torque-application T-56s received a 1-piece cluster, or countershaft, 2-piece clusters (left) were standard for most applications, such as the Cobra and 4th Gen F-car. In the TR-6060 and Magnum, all cluster gears are of the 1-piece variety. You can also see the difference in gear face widths in this photo. Perhaps the greatest difference between the Magnum and all other OE units (TR-6060s included) is its wide range of flexibility features with the explicit intent of being more swap-friendly. Other Magnum components include dual (electronic and mechanical) speedometer pickups, dual-pattern crossmember mount area and commonized 31-spline output shaft that trumps the toughest T-56 in strength. You can see the Magnum’s three available shift locations versus the one on the OE units, which varies according to application. This image also shows the skip-shift solenoid on the T-56, which is required hardware for OE applications to meet emissions standards – not so on the Magnum! There’s still a lot of ground we could cover, and perhaps we will in a future story, but hopefully you now (if you didn’t before) understand and appreciate some of the critical differences between the T-56 and its replacement, the Magnum. Although the T-56 was a great transmission, and continues to faithfully serve in many heavy-hitting street cars, it is simply no match for the Magnum transmission that it ultimately inspired."